Despite its large size and scary visage, this fishing spider was accommodating and docile. This week while working in the yard, I have been impressed by an abundance of rather large creepy spiders that sometimes surprise me and give me the willies. Our first eight legged guest, a large fishing spider, made my heart skip a beat when it fell from an unknown perch as I opened the door of my tool shed. Fishing spiders, such as the brownish-gray fishing spider, Dolomedes tenebrosus, are often found near or in water, but they also hunt in forests and, apparently, near my tools. Dolomedes do not build webs to capture prey. They roam freely and consume a variety of animals in and on water and on land. They can run across the surface of a pool or stream and actually dive and remain submerged for several minutes while they hunt and capture small fish and tadpoles using sharp claws and powerful fangs. Fishing spiders belong to a clan known as nursery web spiders, so called for their habit of building a small web to serve as the hatching place for tiny spiderlings that emerge from an egg sac. Although the brown fishing spider is probably able to deliver a memorable bite, the one I photographed for Bug of the Week posed very politely on my hand. Notice the tiny spiderlings riding on the back of their mother, a rabid wolf spider. A second close encounter of an arachnid kind came with the discovery of a female rabid wolf spider, Rabidosa rabida in my basement. This was a special treat because the proud mother was carrying more than two-dozen spiderlings on her abdomen. The female spins a round egg sac and drags it about until her babies hatch. She then helps them escape their silken prison by shearing it open with her fangs. The tiny spiders clamber onboard their mother’s body and hitch a ride until they are large enough to fend for themselves. 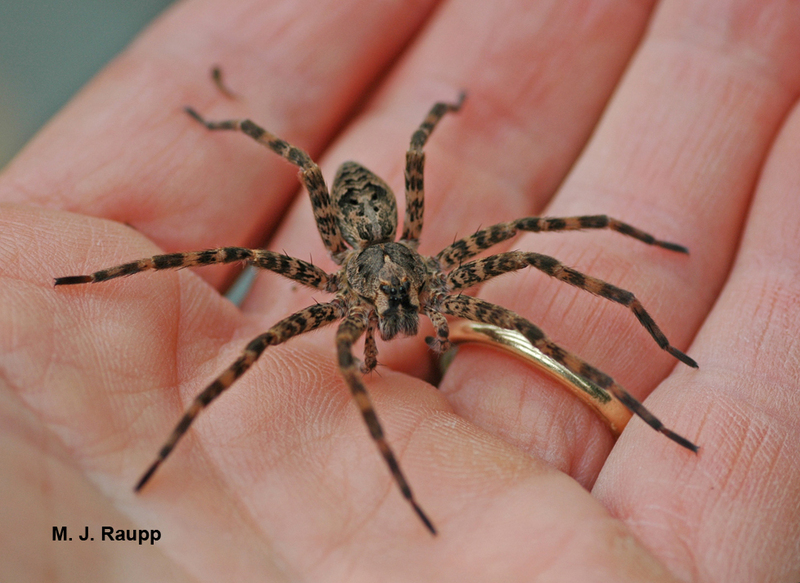 Wolf spiders are among the most common hunting spiders found in our gardens. They are important predators of plant pests such as leafhoppers, lacebugs, and caterpillars. Most wolf spiders do not make webs, but hunt on the ground. Some build burrows in the ground as a refuge to hide in and ambush prey. Although they look fierce, rabid wolf spiders are believed to be harmless to people. However, a close relative of the rabid wolf spider known as the European Tarantula, Lycosa tarentula, was once the most feared of spiders in Italy. Legend has it that effects of the bite from the European Tarantula could only be cured by performing a frenzied, whirling dance called the tarantella. Sounds like fun! With one baby left riding on her back, this wolf spider makes short work of a cricket. Two great references “Spiders” by Ken and Rod Preston-Mafham and “Biology of Spiders” by Ranier Felix were used in preparation of this episode.